The Northern Renaissance refers to the Renaissance outside of Italy but within Europe. Typically the main centre's for art included the Netherlands, Germany and France and all of these countries have become known by the collective name of Northern (North of Italy). Northern Renaissance Art evolved simultaneously but independently from its Italian counterpart. In Italy patrons of the arts tended to be great, and very wealthy families, the Catholic church, or commissions from the many city-states who competed with each other for prestige and power. The house of Burgundy was influential as a patron of the Northern Renaissance artists (Van Eyke is a good example), the fact is that we do not have as much information about the artists of the North, their work is wider spread and generally less well documented than that of their Italian counterparts. The artists of the North differed from their Italian counterparts in that the influence of Gothic art was much longer lasting than in Italy. Although the precision of the early Northern works was much admired in Italy, Northern artists only absorbed Italian ideas at the end of the 15th century. Technical differences between Italy and the North centred on the use of oil paint pioneered by Northern artists such as Jan van Eyck and Robert Campin. Also, the climate of the North did not lend itself to the fresco techniques of Italy, the drying times are just too great, as a result, the North produced very little great works using fresco. Unlike the Renaissance in Italy the artists of the North were less driven by the need to recapture the art of classical antiquity, (they did not share the Italian Mediterranean, Roman and Greek legacy), rather the upheaval in religious reform was the overriding factor in which intellectuals and artists immersed themselves. The first great master of early Netherlands' painting was Robert Campin, also known as Master of Flémalle. A contemporary of Jan Van Eyke his work owes much to the illuminated manuscripts so painstakingly reproduced in books and paid for by wealthy patrons (this was before the invention of the printing press). Masters of Northern Renaissance Art. 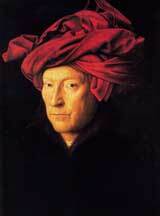 Man In a red turban. 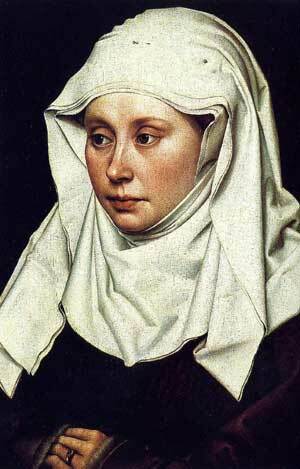 Robert Campin, Portrait of a Woman. 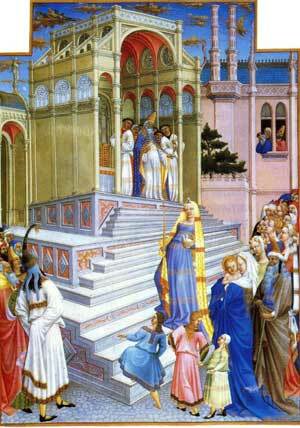 Limbourg Brothers 1413/16 September. From theTrès Riches Heures. Illuminated manuscript. Limbourg Brothers 1413-1416, from the Très Riches Heures. The purification of the Virgin. Guttenberg's invention of the printing press in the 1440s resulted in an explosion of knowledge. The advent of the printed book, previously only available as a symbol of prestige to the elite, was to revolutionise the spread of information. 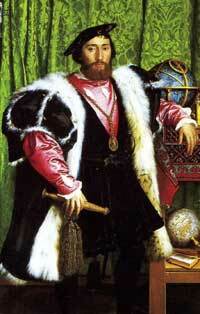 This was vital to the development of the Renaissance in the North and in Italy. The Limbourg brothers from the city of Nijmegen in Holland are perhaps the best-known exponents of the late medieval illuminated manuscript. 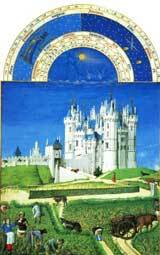 Their Très Riches Heures created for the French prince Jean de Berry is a fine example of their work. Hieronymus Bosch . (Detail). 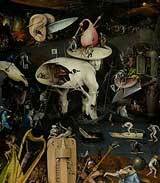 Garden of Earthly Delights. Other notable artists of this early period are Rogier van der Weyden and Hugo van der Goes. 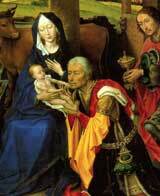 Van der Weyden had visited Italy but his art remained true to the Flemish style, he followed Van Eyke in the service of the Court of Burgundy. Van der Goes was also typically Northern in his approach to painting, however, his work was much admired in Italy. The highly individual work of the artist Hieronymus Bosch, laden with twisted surreal imagery, perhaps set him apart from his contemporaries. The Ambassadors (detail) (s) Hans Holbein. Matthias Grunewald. Christ on the Cross. The German artist Albrecht Durer was not only a painter but was also proficient in engraving, printmaking and mathematics. It was Durer who, more than any other Northern artist, was influenced and absorbed the lessons of the Italian Renaissance. Germany was at the centre of what was in effect the High Renaissance period of Northern art. 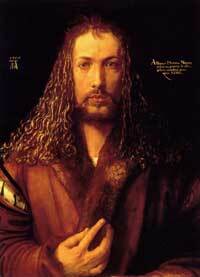 Two artists Albrecht Durer and Matthias Grunewald although contemporaries displayed differing styles in their work. 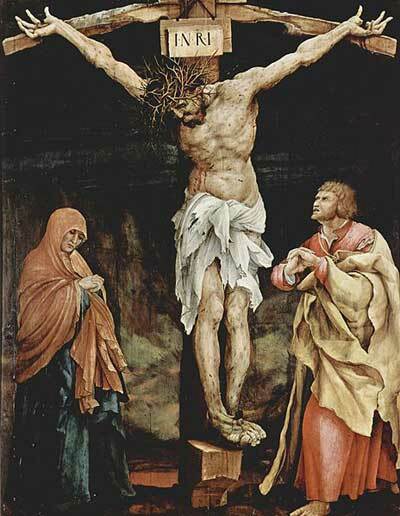 Unlike Durer Grunewald's art remained essentially steeped in the late medieval period and was not influenced by Renaissance classicism. Another German artist of this later period, Hans Holbein the Younger, is famous for his work in the English Court of Henry VIII. The Northern Renaissance was greatly influenced by the Reformation which questioned and weakened the power of the Catholic Church. New 15th and 16th-century ideas and discoveries changed the world forever. From the voyage of Columbus to America in 1492 and Magellan's first circumnavigation of the globe in 1519-22, proving that the Earth was round, to the previously mentioned invention of the printing press the Renaissance in Italy and in the North marked the passage from the medieval to the modern age.